IMPORTANT! It is VERY IMPORTANT that you are mindful of the SVM context for most of these commands. If you have two volumes with the same name in different SVMs, and you don’t specify the SVM, the action will affect both. This is no different than the CLI, where you must provide the SVM to be modified. I am not specifying the SVM with most of the commands against volumes for the sake of brevity, however please, please (please!) keep this in mind as you perform actions against your volumes. This command can now, safely, be pipelined into others which modify properties. Creating a volume is an easy enough operation and works very similarly to the CLI. # the size of the volume. can be appended with "g"
# for GB, "t" for TB, etc. # will not affect LUN sizes, just the volume! If your volume is a SnapMirror source volume, remember that the destination will increase it’s size as well. Get-NcVol $volumeName | Set-NcSis -Schedule "sun-sat@2"
Fractional reserve is the amount of volume space that is reserved for LUN writes when a snapshot is taken. It is only applicable when the volume contains one or more LUNs. In recent versions of Data ONTAP there are only two available values: 0% and 100%. QoS was added to clustered Data ONTAP 8.2 and is an extremely helpful feature for a couple of reasons. One of those is the obvious ability to limit the amount of IOPS or throughput that a volume can use. The other less obvious use is workload characterization. QoS collects many statistics about the monitored workload and can report information like IO size, R/W mix, and much more. # create a QoS policy Get-NcVserver $svmName | New-NcQosPolicyGroup -Name $qosPolicyName -MaxThroughput INF # modify limits, remember a QoS policy can be either IOPs or bits, # but cannot be both Set-NcQosPolicyGroup -Name $qosPolicyName -MaxThroughPut "1000IOPS" Set-NcQosPolicyGroup -Name $qosPolicyName -MaxThroughput "1gb/s"
Set-NcQosPolicyGroup -Name $qosPolicyName -MaxThroughPut "1000IOPS"
Set-NcQosPolicyGroup -Name $qosPolicyName -MaxThroughput "1gb/s"
throw "Unable to find volume with name $($Name)"
throw "Unable to find policy group with name $($PolicyGroup)"
And now, with our functions, we can show, add, and remove QoS Policy Groups from volumes easily. Setting volume options allows you to customize the volume to particular applications and uses. Let’s look at showing, getting, and setting some options. All of the options you would normally modify at the command line can be manipulated using PowerShell. Snapshots are the core principle behind NetApp data protection technology. They are instant, have no performance penalty, and can be reverted to at any time quickly and easily. Get-NcVol $volumeName | New-NcSnapshot -Snapshot "An Example Snapshot"
# it will cause the node to reboot! A FlexClone is a copy of a volume based on a snapshot that usually consumes no additional space, except for new and changed data. It is a writable instance of the data that is contained in the volume at the time of the snapshot. They are particularly useful for testing and development where you can snapshot the production data, FlexClone it to a writable volume, and then do test/dev with real, production data. Combining this with QoS creates the ability to do this without affecting performance for the production environment. Splitting a FlexClone is an operation that happens when you want to separate the cloned instance from the original. It is useful when you want to create a full copy of the data for any reason. Remember that you can not delete the base snapshot of a volume with a FlexClone child until either the clone has been split, or the clone has been destroyed (it is managed just like a regular volume). Volume moves are a feature of clustered Data ONTAP (they aren’t available in 7-mode), and are a feature that fundamentally changes how storage administration is done. Using volume move operations it’s possible to vacate controllers, disk shelves, and aggregates to allow non-disruptive maintenance and lifecycle operations. When executing Remove-NCLunMap and Set-NcVol -offline through PowerShell, you get a Yes/No/Cancel prompt box. Is there any options to force these commands to execute without prompts? You should be able to avoid the message by using the parameter -Confirm:$false with the cmdlets. Thanks for the great article and the reply. It has been a huge help. Thanks for taking the time to explain and post these, Andrew. Very helpful! Hi, thanks for the great article. I am new to PS and I am trying to automate the collcetion of “space used” of a certain volume with date and time on a daily basis and write append it to csv or better xls. I managed to create the script, but not with date and time added. xls should look like this: “date”,”time”,”Volume”,”VolumeSize”,”TotalUsed”. Sounds easy, but I just cannot manage to add date and time . What I have so far ist: 1. $outfile= c:\path 2. get-navolspace -Name volumename | Select-Object Volume,VolumeSize,TotalUsed | Export-csv $outfile -NoTypeInformation -Append . Any hints? Thank you for the great article! It is informative and very well laid out. I am new to Powershell and had a question. I have to create a large number of volumes. I have a file with all the variable ($volumeName, $aggrname, $volSize, Etc.). How can I use this file to create volumes using your create a volume script? I have examples of how to collect that information in other posts: Volume Snapshots and Data Protection. Once you collect the information, you’ll just need to format it however you see fit. While not crazy about it I have to see if it is actually feasible & I think the fundamental answer is yes. 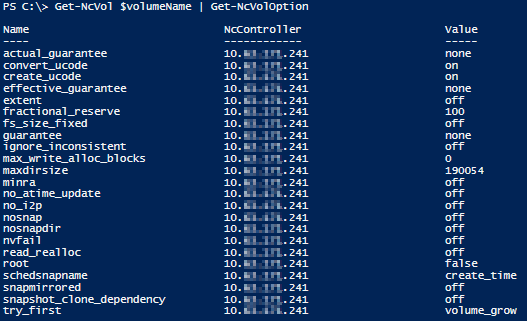 This would of course all go through an API call, but would call the new-ncvol command with certain parameters (like aggregate, vservercontext, efficiencypolicy, junctionpoint=$name, etc??) already set – maybe a template would work?? But for things like volume name (junction point would equal their input name) and size they could input this information (with some limitation/restriction; still trying to figure that one out). Is that possible & easy to do? Honestly I think it would be better to have a default volumes and allow them to create qtrees for their projects and then set quotas that they could manage. That way i can use get-ncquota / get-ncquotareport to show them the values via JSON on a nice web interface with links to be able to manage the quota from another API. Am I off my rocker? Is there a better way of allowing the end users to better create/manage space on the filer using the PowerShell toolkit and APIs?